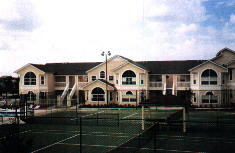 Villas at Island Club broke ground in 1998. Hunter Development was the builder, constructing the 220 unit complex after successful projects in the area that included Shadow Bay Villas, Sommerset, Laguna, Sweetwater. and Royal Palm Bay. After Island Club, Hunter moved a few miles further out of Kissimmee to build Island Club West. The first units were delivered in late 1998. The first two years were challenging as the company started in the back of the development and constructed towards the entrance. That led to some unhappy guests given the construction taking place. Once the construction was complete and Hunter moved on, the condo owners took to transforming Island Club into a top-notch resort. They voted in an ambitious board and brought in an active management company. Since then, Villas at Island Club has been a sparkling gem just minutes away from Disney World's magic.